SAP’s been public about improving its usability, but what does the "Google generation" actually want to see, and do they expect enterprise software to be fun? This is the first story in a two-part series on ERP usability. At his last job, Ashay Arbale worked primarily with PeopleSoft. He liked it -- it was a very clear user interface, very user friendly, he said. The 26-year-old is now back in school, pursuing an MBA with a concentration in IT at Bentley University in Waltham, Mass., where he has been introduced to SAP for the first time. He wants to be an ERP consultant -- a business analyst -- and in a recent class, he was learning how to configure SAP software. For more on SAP at Bentley University, click here . SAP talks openly and often about how it’ll hook users like Arbale, who SAP says want enterprise software that is more Google-like, even fun, as former CEO Leo Apotheker put it in his Sapphire 2009 keynote address. There is no shortage of projects at SAP geared to that end. There are the partnerships with IBM (Alloy) and Microsoft (Duet) to enable use of SAP through the respective popular interfaces, including a completely new product (Duet Enterprise) that will allow users to interact with data in SAP through SharePoint. There’s SAP’s push on agile software development, and its Elements development environment built specifically to experiment with user interface and collaboration technologies, some of which will eventually be bundled into its applications. In the NetWeaver Portal product, which several SAP shops now rely on for delivering user friendly applications, it’s rolling out Enterprise Workspaces, which will allow users to make their SAP desktops look like they want them to, ideally, without the help of IT. There are also efforts to bundle in analytical and business intelligence applications in the ERP products. There are efforts to make the applications accessible on mobile devices, and so on. "Recognizing the changes in the way people want to access information, anytime, anywhere, and on any device is central to SAP's solution strategy going forward, including ongoing refinement to interfaces and the overall user experience," SAP said in a written response. "We constantly seek feedback from all users on how to make our applications user friendly. The perspectives of the group you polled are particularly interesting, since they hold such potential for the use and deployment of our applications in the future." Does the Google generation really want more Google-like enterprise software? Students in the class come with an understanding and an expectation that learning SAP will be complicated -- both by reputation and design. Stories of students up 48 hours straight to get SAP-related assignments finished are not a thing of myth at Bentley. SAP-related assignments in courses taught by Ryan J. Baxter, an assistant professor in the Department of Accountancy, are worth nearly as much as the midterm. 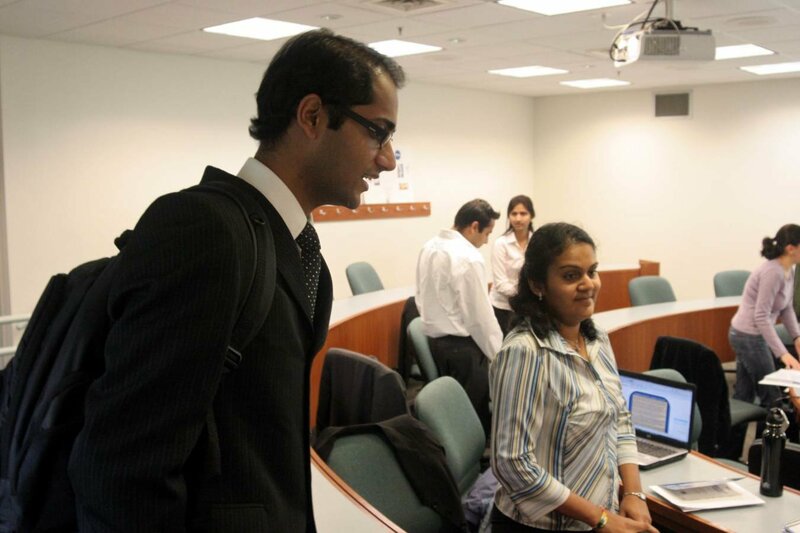 Ashay Arbale, left, and Nilam Maru discuss SAP in a recent ERP configuration class. And students are quick to defend the complexity of enterprise software. Wasiewski has experience in SAP -- several months of using it for sales-order-related processes at a former job. She said at her former job, if users couldn’t remember a transaction code, they’d simply Google it. That wasn’t hard to do. “That’s the nature of SAP. You know it’s complicated,” she said. But they can also quickly point to some simple matters that frustrate them. “The German,” Wasiewski said. The fact that it translates from English to German means that some of the terms they learn in their textbooks don’t match up to the words on their screen. “I don’t know why they have such small fonts,” Arbale said, guessing that maybe SAP doesn’t want users clicking on other icons on the screen that would lead to errors. Professors echoed these concerns. Their students want to get in there and enter transactions, and it’s not like picking up an item and dropping it into a shopping cart, said Noreen Power, an SAP specialist on staff at Bentley to help students trouble-shoot with, among other things, SAP-related assignments. 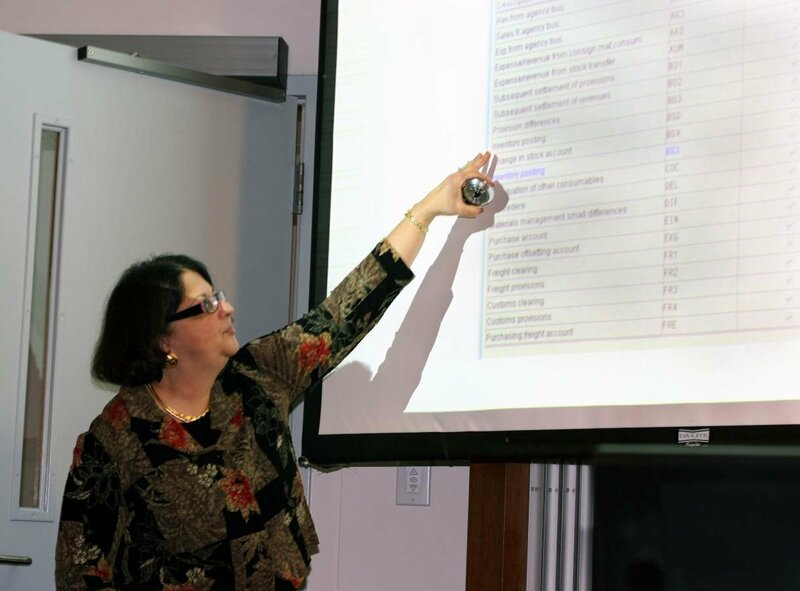 In turn, students sometimes get lost in the frustration of a step in SAP and tend to miss the big picture of what they’re trying to do, said Catherine A. Usoff, associate professor and chair of the Information and Process Management department. Even Bentley itself has been impacted by SAP’s usability. At one time, the college had a much broader vision for SAP and wanted to incorporate it across its courses -- from accounting to supply chain to marketing, etc. But the staff is reluctant to teach it, professors said, because of the time it takes them to learn it themselves. Therefore, it’s found its home in Information and Process Management.